Intelligent text messaging campaign is a must-have tool for any business to communicate important messages and marketing information to customers and prospects. With over 90 percent read rate, text marketing campaigns are very effective to deliver important messages, spark interest and engage people in conversations. 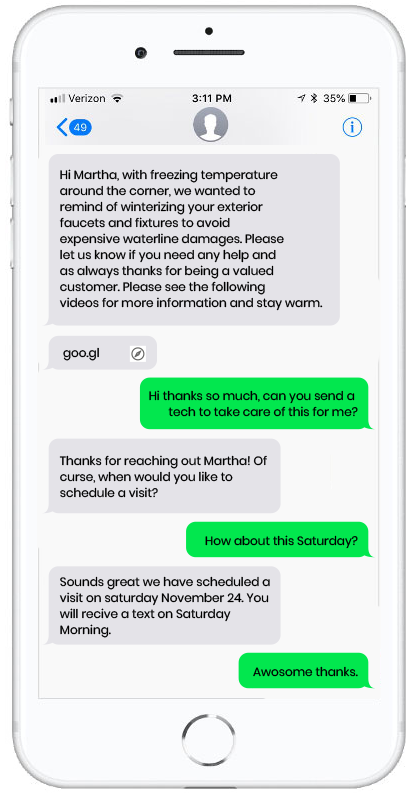 Text Aspect uses business phone numbers and include modern smart tools like trackable web links and chatbots to measure and engage interested recipients in conversations and open possibilities of selling more products and services. Using our smart import tool, you can upload a list of recipients including names and cell phone numbers along with additional individual information to further personalize the delivered messages. Then you can create a text message campaign to deliver personalized messages to each individual phone number. Inserting web links inside text messages makes it possible to track and identify recipients who are interested in your message and click on the web links to see more information. Over 95 percent of texts are seen and read within 3 minutes of delivery. Smart text marketing campaigns are very effective to spark interest and engage people in conversations. Trained Chatbots can conduct natural conversations with people 24X7 and process their inquiries to provide information, solve customer service issues and even sell products and services with no human intervention. Using meta data, messages are personalized for a particular recipient addressing them by the first name. Example: Hi Bob, your car is ready. You can pick it up any time after 5PM.